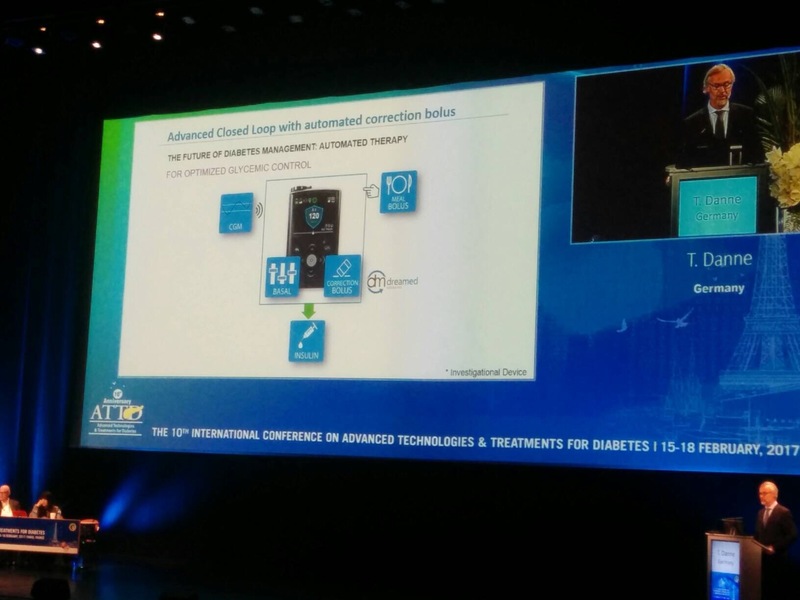 The 10th international conference on Advanced Technologies and Treatments for Diabetes (ATTD) has come to a close and once more the twitter feed has been a frenzy, this time with more “artificial pancreases”, connected meters, big data solutions, CGM and some additional innovations. 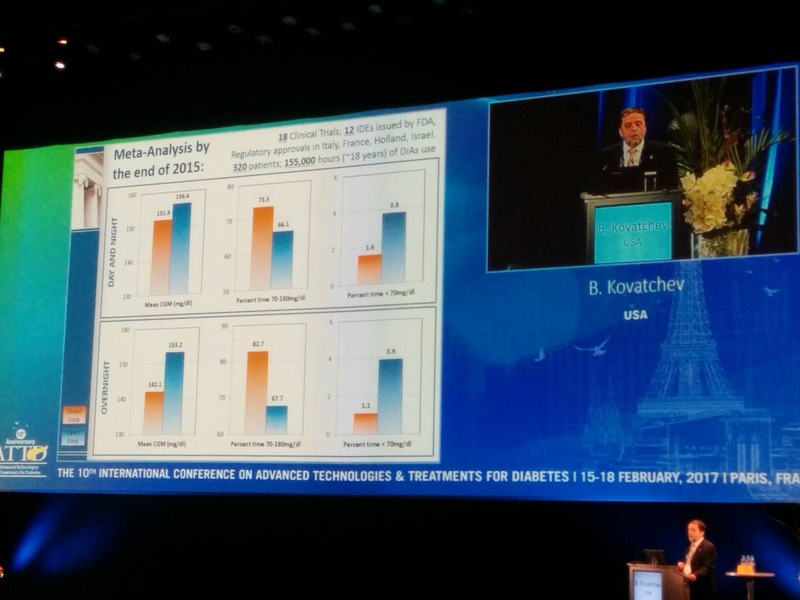 If you add to that the variety of studies that were presented, showing how CGM has a clear and distinct affect on outcomes for T1, the studies relating to improvements in outcomes in use of Hybrid Closed Loop systems and the benefits of better interpretation of SMBG data and you’d be forgiven for thinking that in the diabetes world, all was well and progressing nicely. On stepping away from the headlines at ATTD and back into the real world though, the situation on the ground kicks in and you realise just how ivory tower events like ATTD tend to be. It’s a type of symposium where some of the brightest and most caring individuals in the industry come together to show the progress they are making in managing our disease. What they are doing is incredible. But it sometimes feels like the proverbial cure. Always 10 years away. It’s very much like the position with SMBG in the mid-eighties. Now don’t get me wrong. The innovation on display has been truly amazing. Seeing commercial companies produce products that can eliminate the need to bolus is awesome purely by applying fuzzy logic and algorithms is amazing. 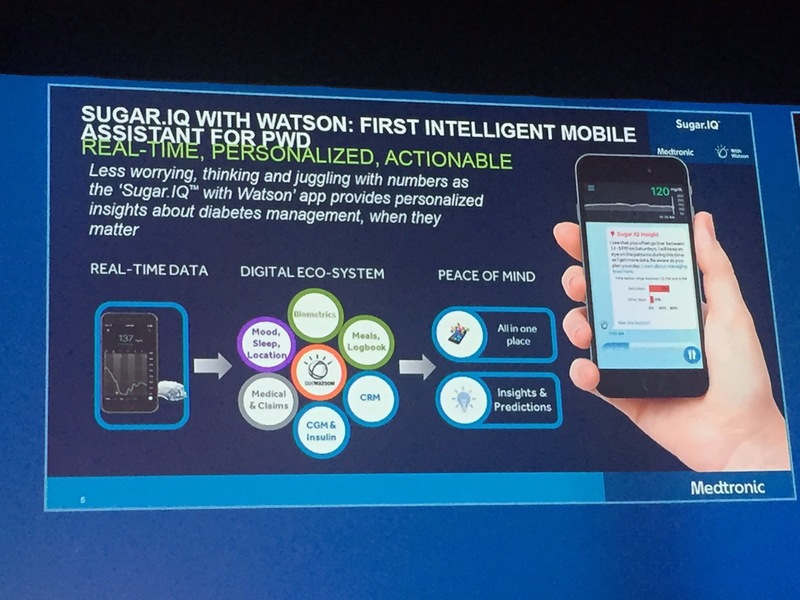 That we can harness all the captured glucose, food and insulin data of an individual so that SugarIQ could say, about the exercise we’re about to take,”I’m sorry Dave, I can’t let you do that” is truly incredible. But to use it, it has to be there with us. In amongst all the tweeting, there seemed little discussion of this. Katherine Barnard mentioned access to technology as an issue from a couple of perspectives. Part of access is about how you persuade people to use it effectively. The other part of access is availability. How do you get it into people’s hands? 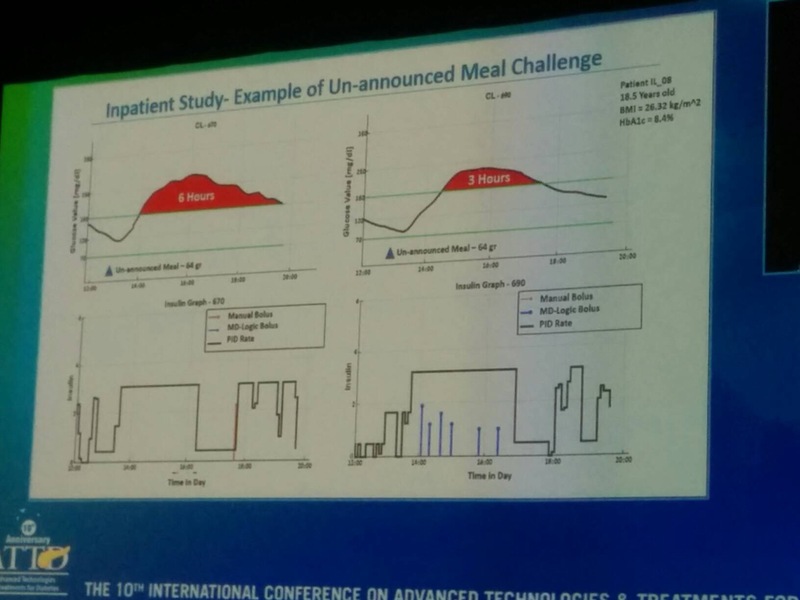 When the message from the keynote speech is that Time in Range should be the standard of measurement rather than Hba1C, it’s great but also a little depressing. To measure time in range you need CGM. Dependent on where you live, that may not be so easy. Ignoring for a moment that this is a first world problem, and that not having easy access to any form of insulin at an affordable price affects the vast majority of people with type 1, in the parts of the world that do have access to technology, it is highly stratified. The “soon to be gold standard” requires a lot of investment. Even the cheapest version (Abbott’s Libre System) will set you back £100 a month. £1200 a year to use full time, and that’s without alerts or a separate reader. It doesn’t seem that much, yet if you earn the average UK salary after tax, you get around £22,000. £1200 a year is 5% of your annual income. That’s a lot. Certain parts of Europe already reimburse Libre use, which is fantastic news for them, as it makes management of the disease a lot easier. Abbott has recognised that it needs to do more though to convince in other jurisdictions and has produced studies and data to back up the benefits. We know that Partha Kar has tweeted on a number of occasions “Watch this space” in relation to Libre. Something may be afoot. Out and out CGM is another question entirely and if used “on-label” according to manufacturer specs, sets you back some £3,000pa (which is why so many of us use it off-label, to bring that cost down to somewhere nearer £1500pa). Still too much. We’re not even talking APS here. That’s another thing altogether, which has an upfront cost in the high £1,000s, whilst retaining the requirement for the already mentioned disposables. Okay, pumps also cost thousands, but the APS systems are being rumoured to be even more expensive. The cost isn’t driven entirely by device development, either, but by the need to test and get regulatory approval, which isn’t a cheap process. 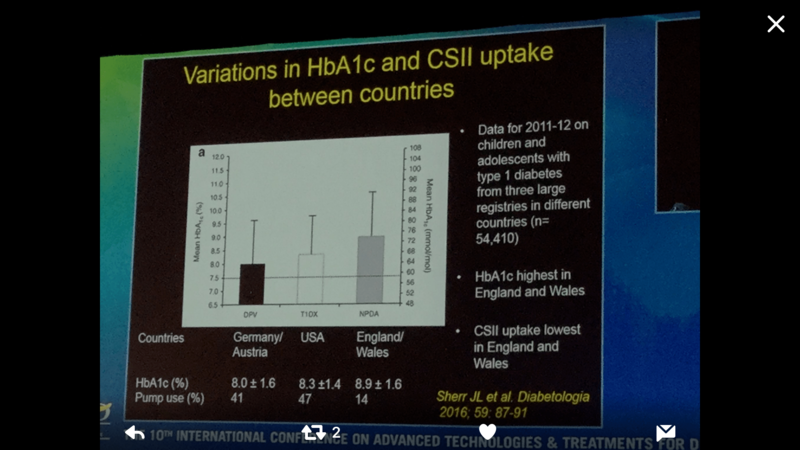 If we jump back to the UK for a moment, which in 2012 had some of the worst figures for pump uptake and Hba1C levels, as quoted by John Pickup in his presentation, I have to wonder which of this technology will get into the hands of us mere mortals? With NICE QALYS assessments, will the committee look at the data presented and decide that not having to constantly undergo the mental burden of diabetes and maintain great time in range is worth the cost to the NHS of not only providing the devices, but also the required support and services to those who won’t read the manual or just pick them up and go (i.e. the silent, non-SoMe majority)? 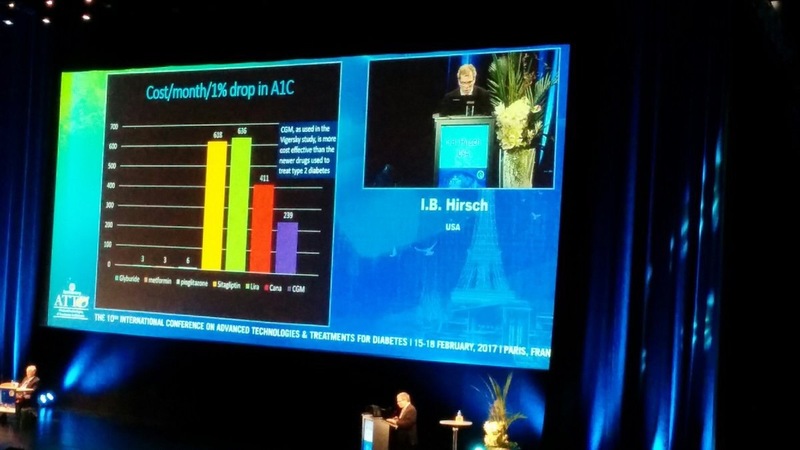 How much is the reduction in complications for T1D worth? Much as we may not like the answer, not a huge sum of money, when you compare it to the T2D costs. So where is this taking me? We know that getting this stuff into the hands of everyone who wants it isn’t cheap. We also know that not everyone wants it. But to make it accessible, pricing structures need to be innovative and change. This is something that Bigfoot have talked about, in terms of providing access to their products. Around 40% of T1Ds in the US use pumps. Less than a quarter of that number in the UK do. If you pay a lot of money in insurance then you get access to the care you want, but if you don’t, you get the plethora of models in Europe. I’ve said before that I’d like to see the UK Health Service take a different approach to these technologies. Instead of the piecemeal approach to purchasing that we have across the UK, the NHS should be following the model of London. CCGs should be pooling their buying power and negotiating on a huge scale to get discounted pricing, and most importantly, allowing pass through purchases. Those who want to use tech to help with their diabetes should be able to buy it through the NHS at NHS prices. This needs to be ameliorated with another factor. The initial pricing also needs to be lower. Those that make technologies and treatments need to reduce those costs, without affecting safety. Is this possible? Can pricing structures that guarantee prices for volumes be introduced with healthcare providers? Could we see substantial subscription discounts linked in to these models? Once you start to open up the topic of access, the questions keep coming. Ultimately the question of getting life changing treatments and technologies into the hands of the users comes down to three things. Without all three of these being addressed effectively, those of us with the first on the list are left to take it into our own hands. I couldn’t agree more Tim. Another great article. As well as the three things needed to get the technology into the hands of the users, there is a third vital component. Education. Not just education of the users but also of those advising them. Without this, widespread distribution could be a costly mistake. Just look at the Facebook groups; the amount of support given to users who have shown commitment by paying out over £1,000 a year. Look there at the horror stories of “Consultants” who say CGM is full or errors and they only want fingerpricks. I do feel that users have to take some responsibility to educate the NHS professionals. We also need to set up a mutual support system or network that runs alongside Social Media. That needs to be Funded! Best similar example I can come up with was the introduction of computers into schools and colleges. Promoted and developed by groups of individual teachers in conjunction with manufacturers and a government programme. Pump priming it was called, part funding worked despite fierce resistance from head teachers and local authorities who refused to fund or disperse scarce resources. I think that’s a great idea. I don’t have any insight into it, but I get the impression that Abbott have been doing something like this with the Libre. It just needs extension. We also need to remember that there are some incredibly tech savvy consultants out there, many of whom are as frustrated as we are about access to technology. The postcode lottery plays a big part in who you find yourself dealing with. It is great to see the industry and health experts agree that better use of data and APS systems are the future, but we are still not addressing the issues on the ground and that’s access to technology, namely CGM and Insulin Pumps.